That was just one of the many questions asked this past Saturday at the Hispanic Parent Summit held at Anderson Elementary School. The summit connected parents from schools all over District IX to representatives from HISD’s Literacy, College and Career Readiness, and Multilingual departments, as well as Houston Community College, University of Houston, Catholic Charities, Houston Public Library, and many more. This entry was posted in District III - Sergio Lira, District IX - Wanda Adams, District VIII - Diana Dávila and tagged Anderson ES, FACE, family and community engagement on March 9, 2015 by HISD Communications. HISD District IX Board Trustee Wanda Adams has partnered with the Family Learning Academy to host the District IX Hispanic Parent Summit from 8 a.m. to 1 p.m. on Saturday, March 7, at Anderson Elementary School (5727 Ludington 77035). The free event will connect families with resources that support student success. This entry was posted in District IX - Wanda Adams, Parents and tagged Anderson ES, FACE, family and community engagement on March 3, 2015 by HISD Communications. 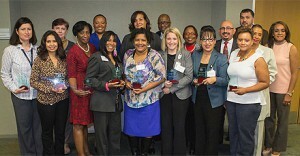 Dr. Roslyn Stiles Vaughn, principal of Anderson Elementary Dual Language School, was honored by the Houston Area Alliance of Black School Educators (HAABSE) with the 2015 Living Legend Award. Dr. Vaughn has served the district for 36 years, 28 of those at Anderson ES. She began her career as a teacher at Scarborough, Brookline, and then Anderson elementary schools, before serving as principal for 16 years. This entry was posted in District IX - Wanda Adams, Elementary Schools, Teachers and tagged Anderson ES, Dr. Roslyn Stiles Vaughn, Houston Area Alliance of Black School Educators, Living Legend Award on February 24, 2015 by HISD Communications. It was a night filled with good cheer during literacy night at Anderson Elementary Dual Language School, when dozens of students and their parents showed up to celebrate literacy and the holidays. Reading, games, and art projects kept students entertained, as various prizes were awarded and refreshments were served. This entry was posted in District IX - Wanda Adams, Elementary Schools, Literacy and tagged Anderson ES on December 12, 2014 by HISD Communications. This entry was posted in Achievement/Recognition, District III - Sergio Lira, District IX - Wanda Adams, Elementary Schools and tagged Anderson ES, Sanchez ES on December 12, 2014 by HISD Communications. HISD’s Combined Charities Campaign concluded on Oct. 31 this year, and when all of the pledges were tallied, district employees had contributed more than $309,000 to support their favorite causes. This entry was posted in Achievement/Recognition, District IV - Jolanda Jones, District IX - Wanda Adams, District V - Sue Deigaard and tagged Anderson ES, Bellaire High School, Combined Charities, Madison High School, Strategic Partnerships, Yates HS on December 10, 2014 by HISD Communications. Many Houston ISD schools held special events to celebrate International Literacy Day on Sept. 8. Anderson Elementary School students held a parade of book characters, and they participated in a special presentation of the Wizard of Oz. Students and staff donned costumes to perform the story. This entry was posted in Literacy and tagged Anderson ES, Memorial ES on September 8, 2014 by HISD Communications.